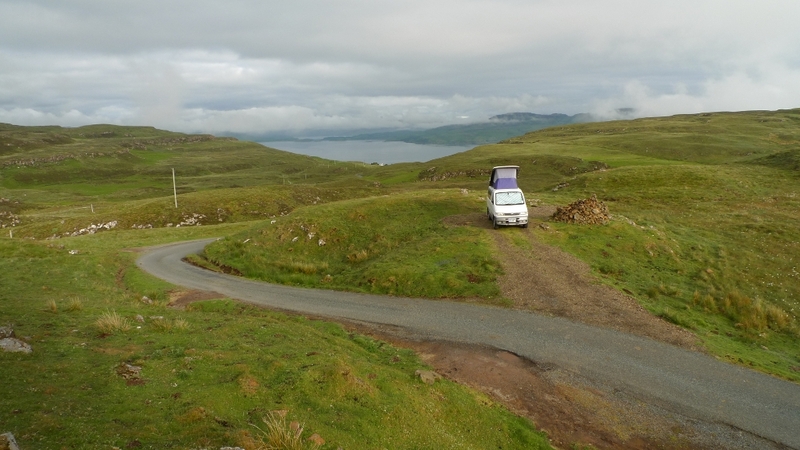 After the Clennoch bothy walk I was keen to find somewhere quiet and out of the way to spend the night in the Bongo. I spotted on the map a car park marked at the far end of the Garroch burn. A lovely twisting wooded valley with a thin strip of tarmac that could only just be counted as being a road. I noticed Southern Upland way markers at intervals along the road, which although on tarmac would still give a fine walk. 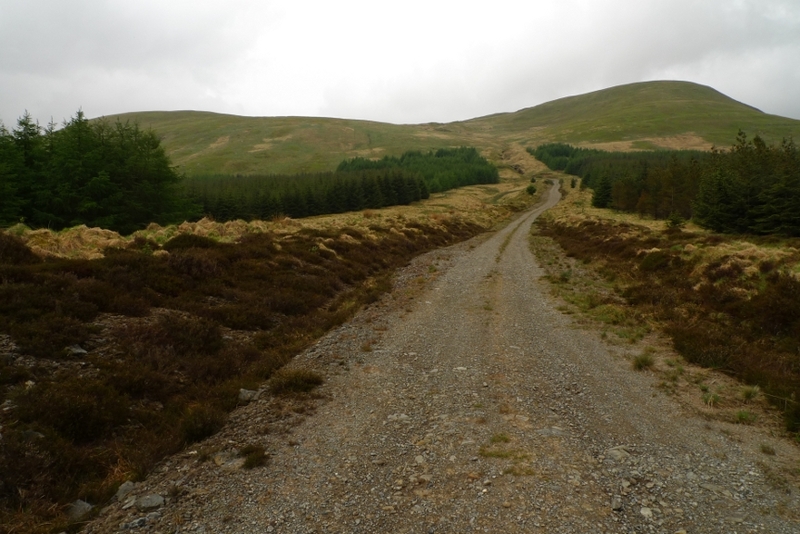 Suddenly the road proper ended with a farm track heading towards Drumbuie and a rough forestry track continuing on ahead. I decided that my map could not be wrong so bounced my way down the track where a kilometre later there was a parking space for three or four vehicles and a sign asking you to try and not burn the forest down. Again I spent the evening and night completely undisturbed with only a cuckoo and some midges for company. Who would have thought that it was a late May bank holiday? The morning dawned bright and sunny and I was keen to get to the car park just over the hill in the middle of the Forrest estate. Although only a couple of miles away as far as the crow flies it was a lengthy journey by road. There was no way that I was going to attempt to walk across what looked like impenetrable conifers instead. The Forrest Lodge car park was almost heaving with vehicles, well if you can count a total of 6 cars as heaving. A very busy spot in these parts! It often makes me wonder why some hills are packed when at the start of a stunningly wild area there are only a handful of visitors, such as here. It’s not like it is massively off the beaten track. It was a beautifully sunny bank holiday sunday, I had some cracking hills ahead of me and I would probably have them to myself (due to my habit of never ever setting off at the crack of dawn). 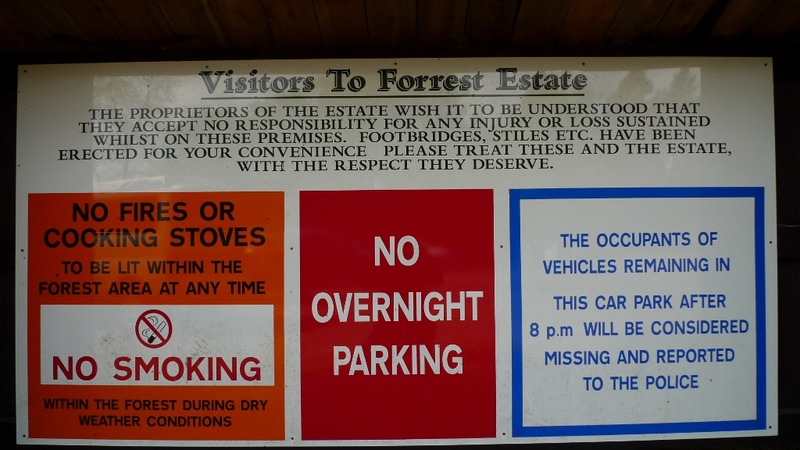 You may have noticed from the photo below that the Forrest estate are keen to assert their authority. I spent the whole day being mindful that I should be back by 8.00pm. Is their sign just a ruse to make sure you don’t stay overnight or will they really report you missing if you don’t get back in time? I have to admit that it really spoilt the last hour of my day, but more about that later. The track into the forest ran straight past the sign and I was soon passing the rather lovely house at Burnhead, which has one of the biggest lawns I think I have seen. I played the usual fantasy house buying for a while (easy to do when you live in an inner city terrace) as I continued up the track. I soon reached a watch tower and considered climbing to the top for a nosey around, however is was rather rickety and I did not fancy a rather long fall. The track continues unmarked on the map which makes things a little confusing, luckily the weather was clear and I could tell I was heading in roughly the right direction. A narrow path branches off of the track and is marked by a wooden pole, otherwise it would be easy to miss. Although narrow the path is well enough defined to make progress easier through the rough ground. 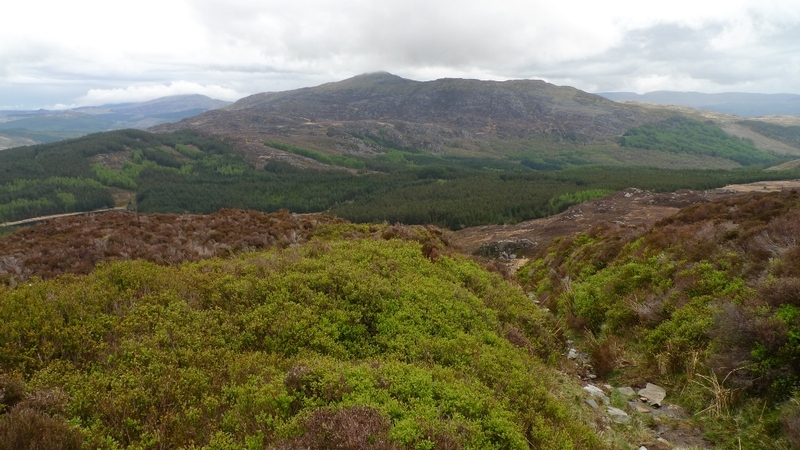 As usual as height was gained the views opened up, it’s always good to climb up and out the creeping green blanket of a forestry plantation. A bit of huffing and puffing and the ridge just beneath Meikle Lump is reached, the angle eases and the vegetation underfoot becomes much easier. 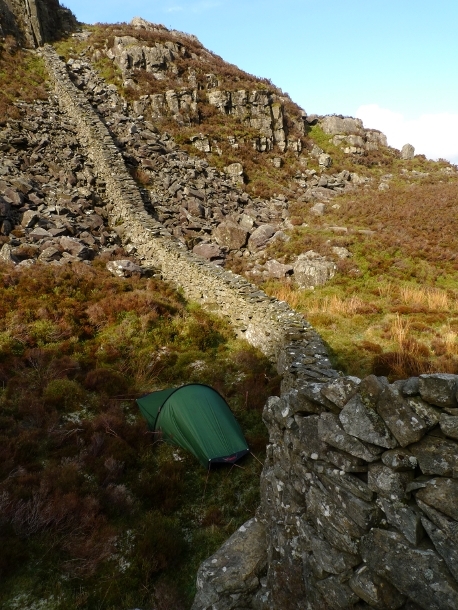 It is a simple case of following the low wall up to the trig point. As I reached the trig I started to suspect that this was not the highest point of the hill as a cairn a few hundred metres away looked higher. 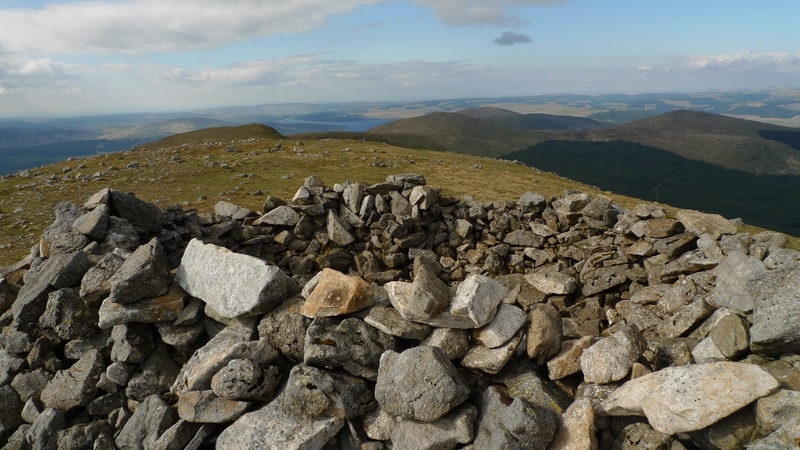 The map does not really show that there is a dip and rise to the the cairn, which when I reached it was definitely higher than the trig point. With northerly winds the air was really clear and the views extensive. 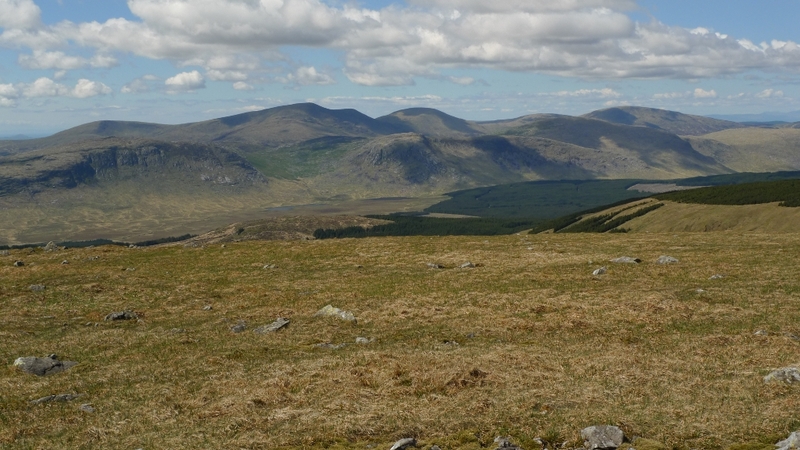 Dominating the view was the range of the awful hand which includes the highest hill in southern Scotland, Merrick. However the eye is drawn to the lower Dungeon hills with their extensive cliffs and rocky slabs. 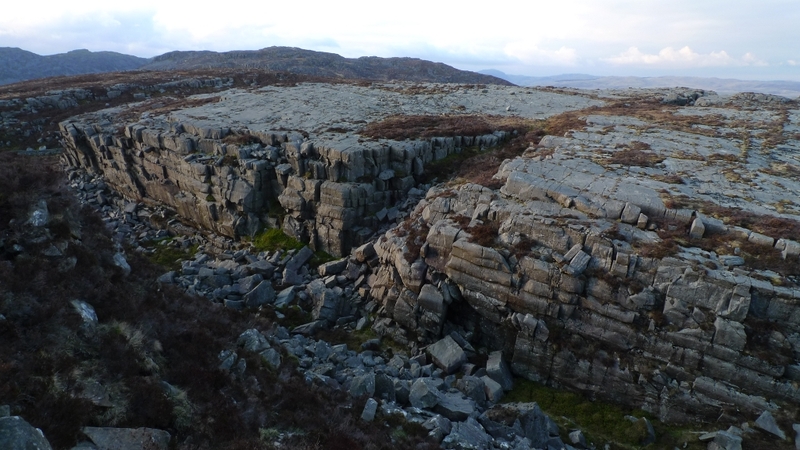 An area that I have backpacked in a couple of times before and is definitely a place to savour, almost similar to the Rhinogs in character but with giant tussocks replacing the deep heather. Not a place to be wondering about on a misty day. 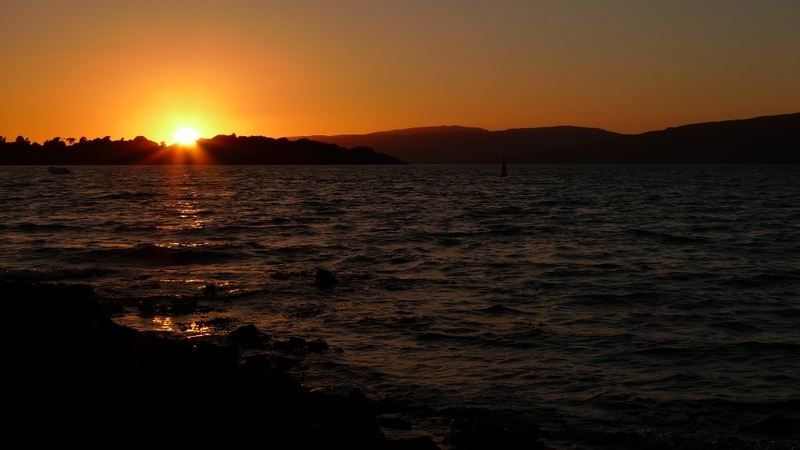 My eye was then drawn to some dramatically spikey hills on the horizon across an expanse of water. The Isle of Arran appeared surprisingly close. The wind was strong and cold today and a drystone wall provided perfect shelter to sit and have lunch whilst taking everything in. The descent to the Lochans of Auchniebut was across increasingly boggy ground although even in a pair of inov-8’s I managed to keep my feet fairly dry. 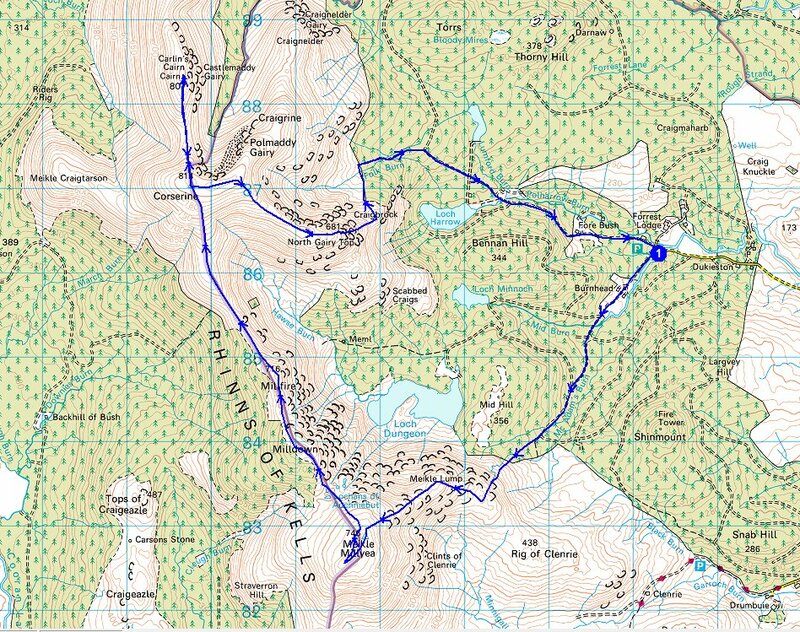 It looked like there may be a few good wildcamping spots in the area around the lochans although I did not have the time or energy to explore properly. 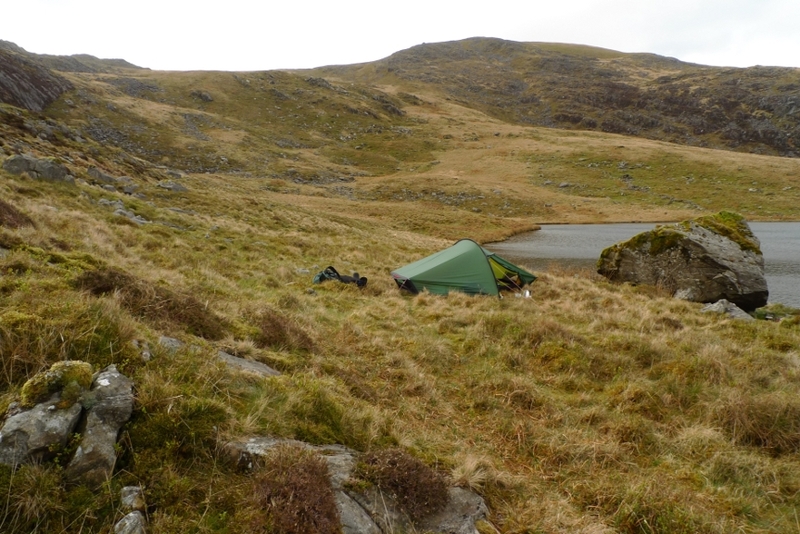 If you come here to wild camp and it is rubbish don’t blame me! On the ascent of Milldown there was a distant view of Loch Dee and the southern hills of the forest park. 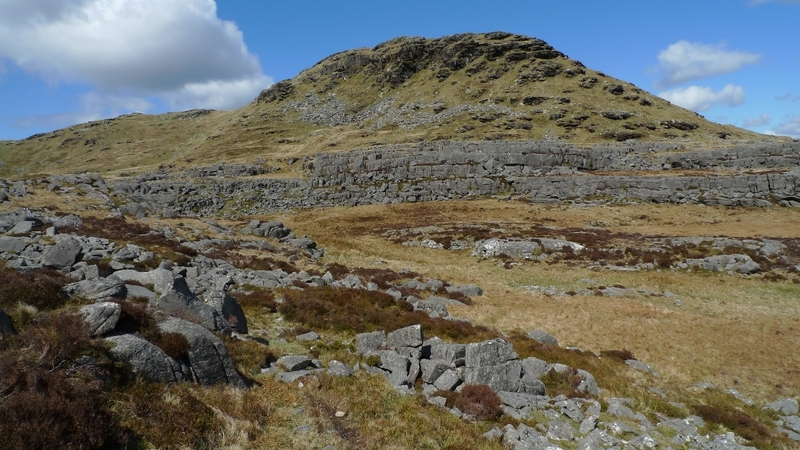 There are a succession of small ascents and descents along the ridge including the minor summits of Milldown and Millfire. I stopped several times as the weather started playing with me. It seemed that one minute it would be clear blue skies, the next they would turn leaden and there would be the odd spit of rain. I alternated between my waterproof and windproof before finally settling on the windproof, I though sod it if I get damp. You can have a different attitude when day walking compared to backpacking where I prefer to stay dry. Luckily the rain never came and it started to clear up again. I passed a family of four who were dressed as if they were about to ascend Everest, full on mountain boots, gaiters, winter jackets and what I assume was dad was buried in a large red woolly balaclava. I almost felt almost naked in ronhills, running shoes and tshirt with a light windproof over it, how irresponsible of me. Corserine had been dominating the view ahead for most of the day and at 814 metres it is a large bulky hill, its big enough and has a sufficient drop all around to make it a Corbett to boot. From Millfore it’s a long old grassy slog to the summit, easy but a slog no less. 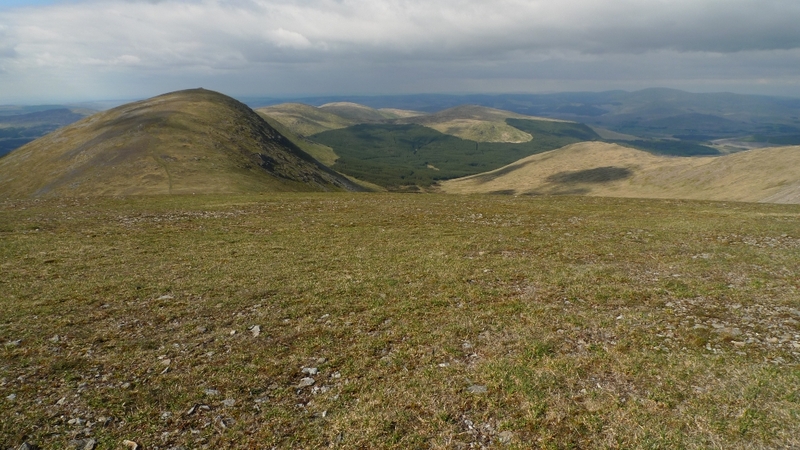 The higher you go the lower the vegetation, by the time you reach the summit it is as cropped as a bowling green. A bowling green that is a bit stony. As I got to the trig point I had a decision to make, Carlins Cairn was calling to me but my legs were feeling decidedly wobbly. I sat down and had a little think. It would be a 100 metre descent followed by a 100 metre ascent followed by a 100 metre descent followed by a 100 metre ascent. When planning a walk it is easy to laugh in the face of contours but they have a strange way of laughing back when facing them in the flesh. As it turned out I decided to go for it and as usual the downs were easy and the ups were not so easy. The top had a massive cairn and a slightly different view to that of Corserine, an hour later I was standing in the same spot where I had done the umming and aaaring. 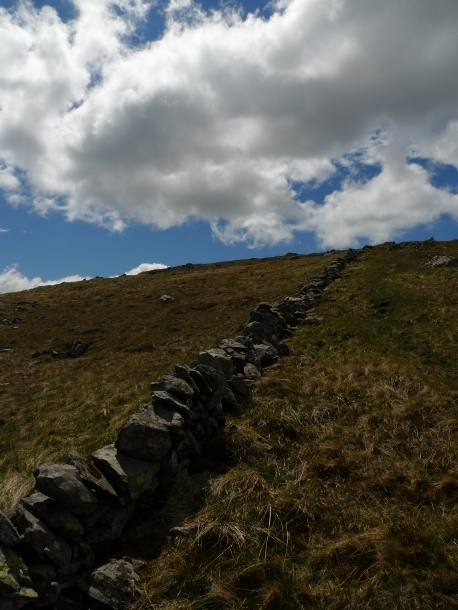 A nice easy descent east to the cairn on North Gairy top and then it got steeper and rougher the lower down I got. I had read a guide book on how to get through the forest before leaving home but I found the exact route had slipped my mind. I was sure it involved Loch Harrow but from my vantage point I could see no way to it through the dense conifers. I suddenly became aware of the time. In less than an hour there was the possibility of the police being called if the sign at the car park was to live up to its threats. I decided to have faith in the map and head down Craigbrook and the folk burn where a path is marked, heading into the depths of the forest. Down at the burn and looking up to Corserine it felt like I could be in the Highlands, there was even the odd midge to add to the authenticity. The route back to the car park almost went smoothly until I lurched straight into a big stinky bog. I had managed all day in running shoes and kept dry feet, now my shortie gaiters were full of smelly stuff. I squelched back to the van with minutes to spare. A fantastic day out among some great hills which I almost had to myself. It’s just a shame that I could not have lingered a little longer and watched the sun set, that is always the bonus of a backpack. It’s just that I had to get back to that damn car park before eight. Before I take you for a stroll around the Island of Mull we need to go back a few weeks in time to the last bank holiday……….. I had taken the Friday afternoon off work and the Bongo was ready and waiting for the long drive up north. I had been planning to go to Dumfries and Galloway for a few weeks but my plan kept changing every five minutes, I just could not decide what to do! 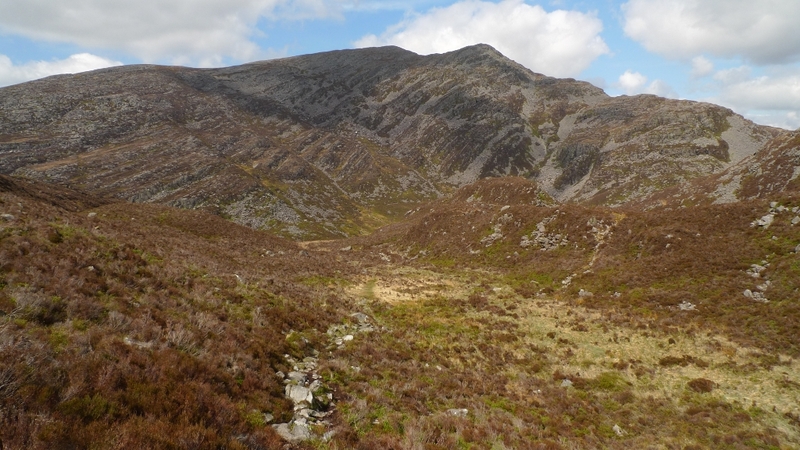 I really wanted to walk the entire Rhinns of Kells ridge from south to north as a backpack but I could not work out a reasonable return route. 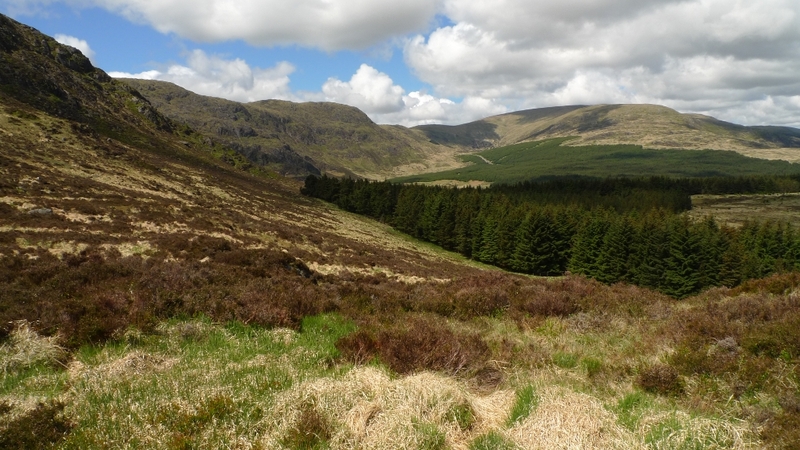 In the end I decided that it was possible to split the Rhinns of Kells into two day walks. 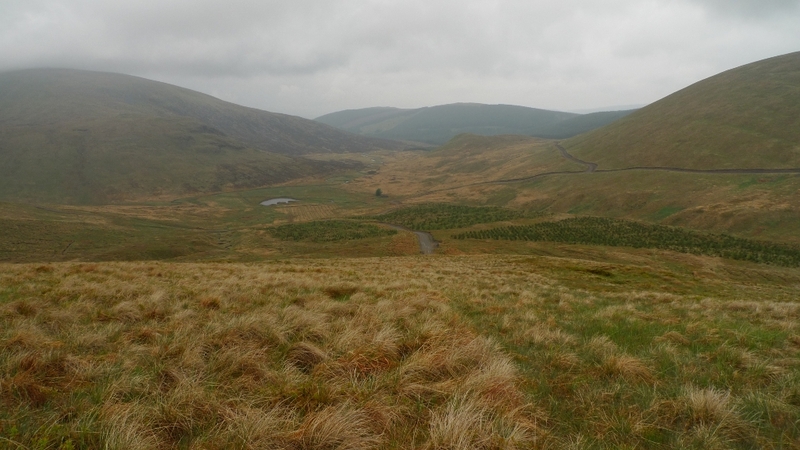 This meant that some luxury Bongo ‘wild’ camping would be the order of the day, this part of the Galloway hills being perfect for finding hidden out of the way spots. 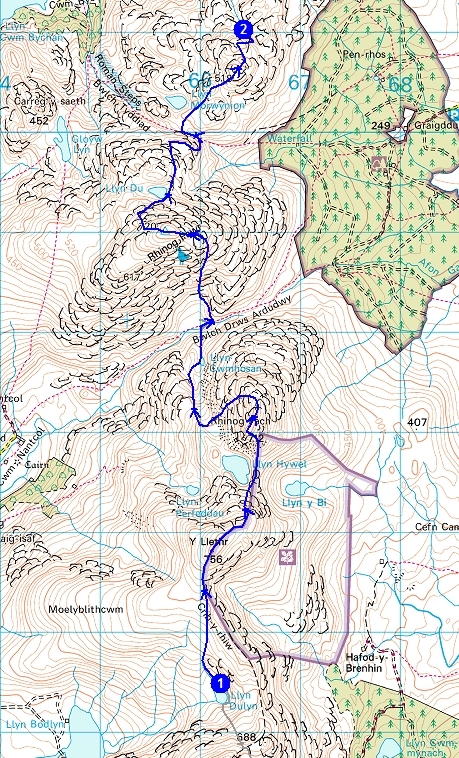 It turned out that the Saturday was going to be a bit crappy weather wise, not a good day for the high hills. 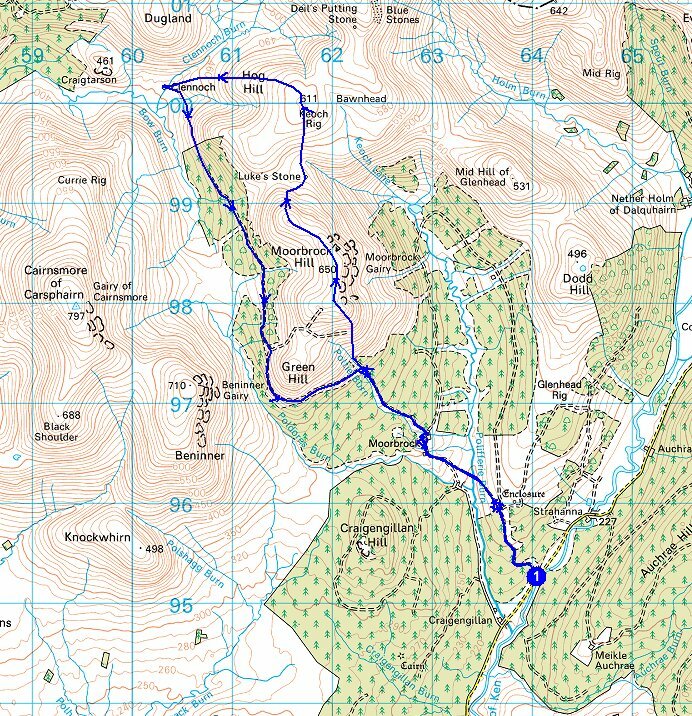 A quick consult of the map before setting off from home showed a nice looking route that would take in a bothy to use as a lunch stop. 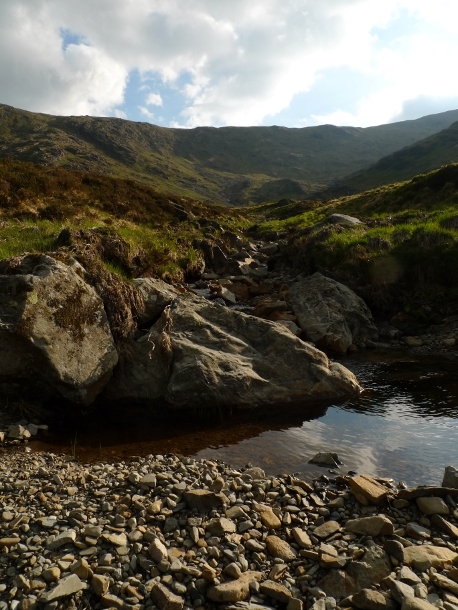 Therefore late Friday evening I found myself driving down the isolated glen called Water of Ken (brilliant name!) where I found a very isolated car park at the head of the glen. Newly made its size was all out of proportion to the isolated valley and is a bit of a blot on the landscape. However I was completely undisturbed all evening and night. I awoke to dark cloudy skies and a little light drizzle. 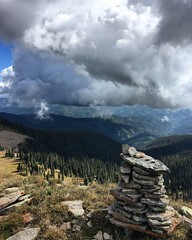 The clouds were just skimming the tops of the surrounding grassy hills. 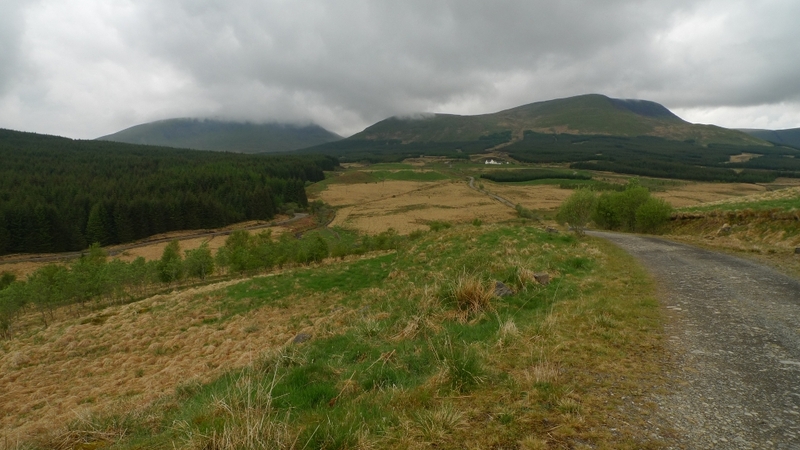 I drove back down the glen and tucked the van in at the start of the track a few hundred metres north of Craigengillan. Initially through boring conifers the track gains a little height and exits the trees with a good view of the route ahead. The skyline being dominated by Moorbrock hill directly ahead with the huge bulk of Cairnsmore of Carsphairn to the left, unfortunately today capped by cloud. The route ahead was quick and easy and passed behind the large and rather extravagant new looking building of Moorbrock, its intended use possibly being that of a shooting lodge. 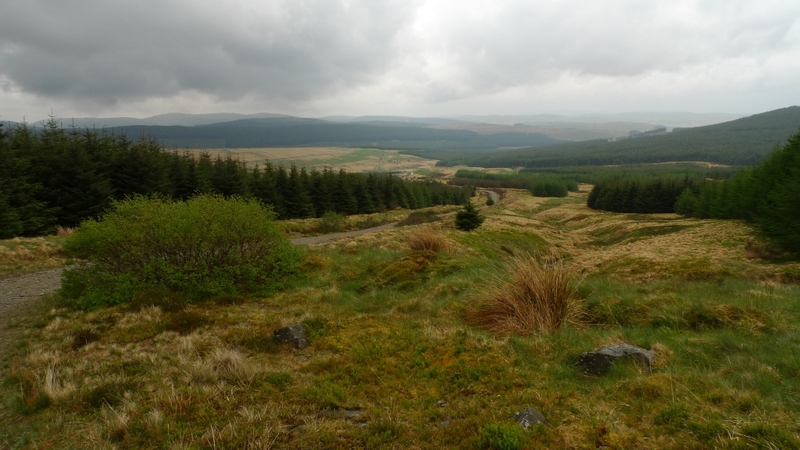 The track continues easily uphill gaining height slowly towards Moorbrock hill with the view behind opening up with a patchwork of moor and forest. Not a particularly wild landscape as it has been shaped by the hand of man, but definitely a very empty landscape with hardly a building in sight. In the distance on Benrack I could make out one of the striding arches made by Andy Goldsworthy, they definitely look like they are worth a visit. Pete in his excellent blog ‘Writes of Way’ did a walk around them, you can access the post here. 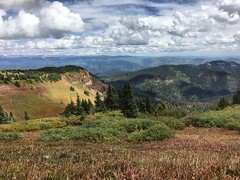 It soon came to the point when I would have to leave the comfort and ease of the track and strike off up the pathless hill. Steep grassy ascents do not usually fill me with the joys of spring and here the word ‘slog’ could definitely be used accurately. However the views were getting bigger with each step as I walked through a deep carpet of bilberry. If you fancy picking some in the autumn, here is the place to come. My legs and lungs needed a brief rest and the bilberry gave a great bed to lie back in. 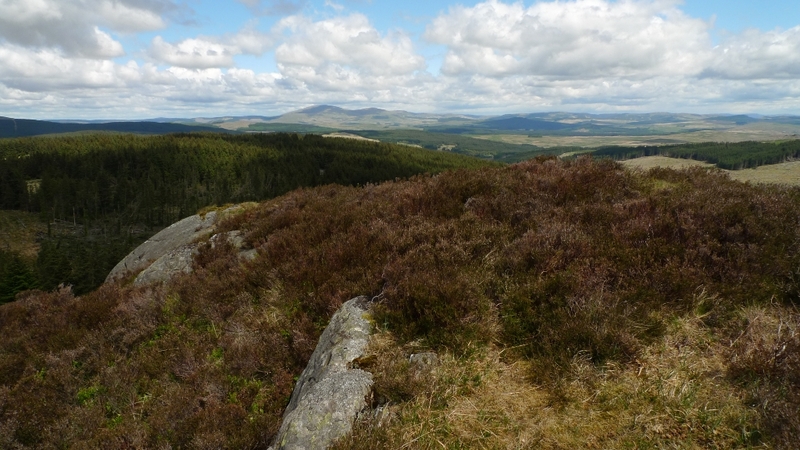 It was good to be still and watch the clouds drift by giving brief glimpses towards Cairnsmore of Carsphairn. The walk across the summit plateau of Moorbock hill was pretty uneventful with distant views being blotted out by the cloud as it drifted past. However close to the edge of Moorbrock Gairy there was a great feeling of space with the steep hillside plunging down to the conifers below. The horizon ahead was now filled with the spinning blades of a huge windfarm on the aptly named Windy standard. I feel that this is an unwelcome intrusion on what would otherwise be a very wild and empty place. My map showed a dot called Luke’s stone which I thought may be worth a visit. It turned out that it really was not. It was simply a boulder no higher than my waist, although to be fair it probably is the only such feature for a distance here. A quick squelch up and across Keoch Rig with the mist descending all the while made me start thinking about getting the compass out. 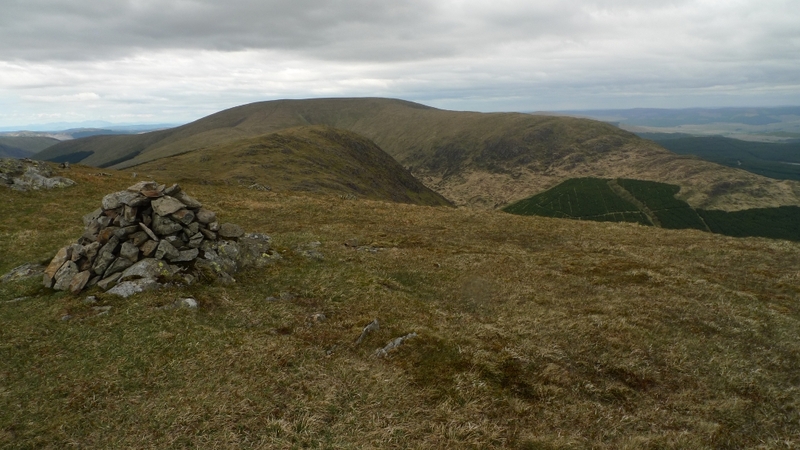 However the wide ridge of Hog hill was soon reached and I started the descent into the bowl that holds Clennoch bothy (a tiny spec next to the lone tree in the picture below). A closer view of the bothy with the large bulk of Cairnsmore of Carsphairn in the background. I was pretty wet as I approached the bright blue door of the bothy. There were a few bird feeders next to it which were crowded with a large range of small brown birds and some small brightly coloured birds (you can tell that I am not a ornathologist!) darting between them and the tree next to the bothy. Inside was really cosy and homely and it took me a few moments to realise that someone was on one of the bunks asleep. I shuffled around as quietly as I could whilst I ate my lunch and read the bothy book. The occupant stirred and upon chatting with him found out that he was the maintenance officer of this bothy which is maintained by the MBA. 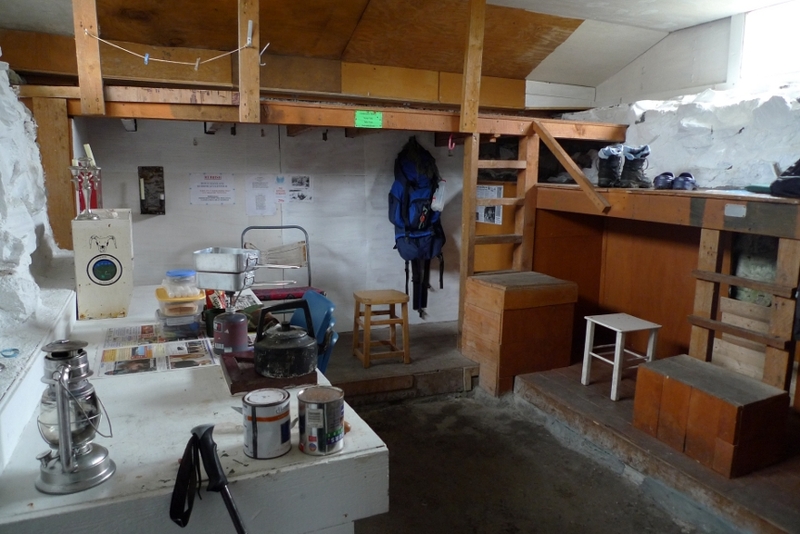 He definitely has been doing a great job as this is one of the better cared for bothies that I have visited. There is one downside which has probably contributed to it not being trashed by idiots. It does not have a stove and is meant to be famously cold inside in the winter months. For some reason bothies with stoves or fireplaces seem more likely to attract idiots, it is often only sheer remoteness that saves many bothies. It is sad that two bothies located nearby in the Galloway forest park have been handed back to the owners by the MBA as they feel they are not worth maintaining any more. 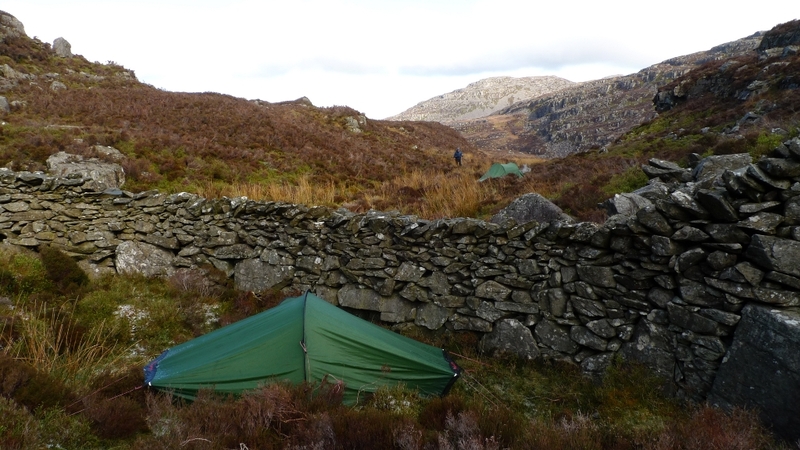 Decades of misuse as party venues and drug dens meant that genuine hillwalkers were too afraid to spend the night there. I remember years ago reading the bothy book in White Laggan where a hillwalker described characters not too dissimilar to those in the film Deliverance hanging out in the nearby Backhill of Bush. There were large quantities of hard drugs and alcohol being consumed by the group of males. The hillwalker retreated to White Laggan as they feared for their safety at Backhill. 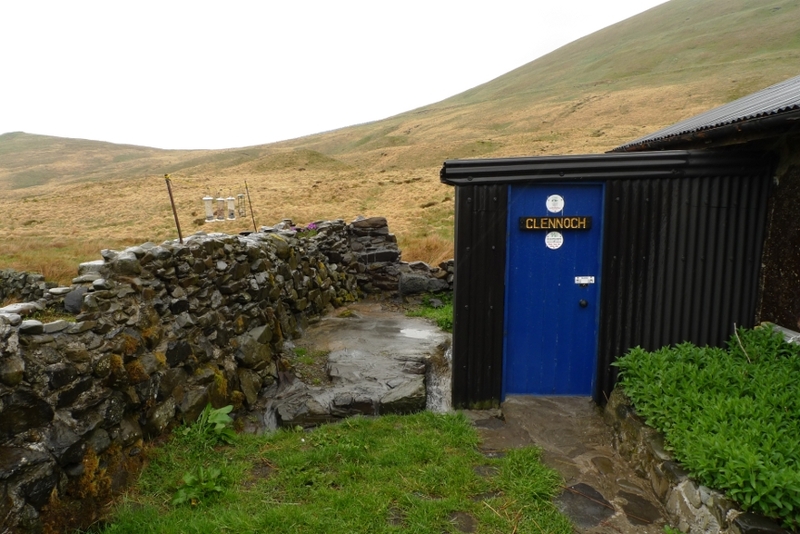 It is with the hard work and dedication of people such as the maintenance officer of Clennoch that keeps many bothies going. 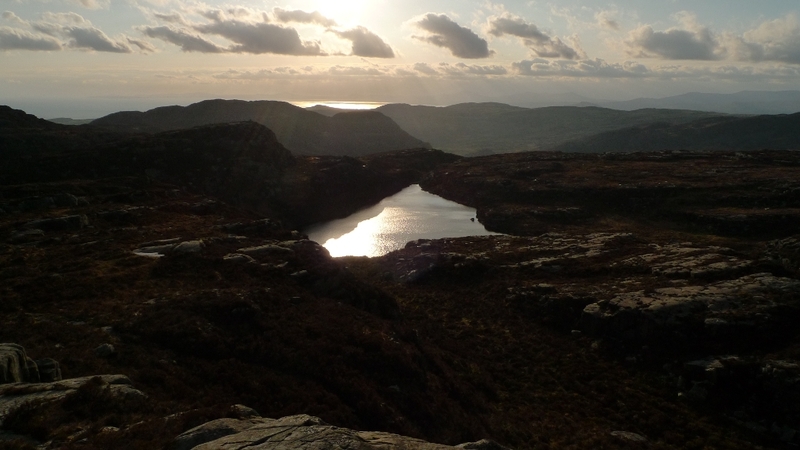 If you enjoy the wild places and spend the odd night in a bothy then you should definitely join the MBA. Their website can be found here. The MO was going to stay for a few days and do some odd jobs around the place. I decided that I could not put off going back into the rain any longer so left him in peace. Although it is not shown on the current 1:25,000 maps there is now a forestry track all the way back to the road. This climbs to the head of a wild and desolate valley with Cairnsmore of Carsphairn dominating the view once again, a hill that is definitely on my tick list. I was soon retracing my outward route, eager to get back to the van and out of my waterproofs. I returned yesterday from a magical week on the Isle of Mull. A splendid time was had and for once the weather was kind to me for most of the week. In fact I started to regret not taking my backpacking kit with me as there was plenty of opportunities to camp high and wild among some very empty mountains and coastline. I did however have the comfort of the Bongo and parked up for the night in some idyllic spots. Three days were dedicated to some cracking mountains with the Munro Ben More and the Corbett Dun da Ghaoith being climbed. 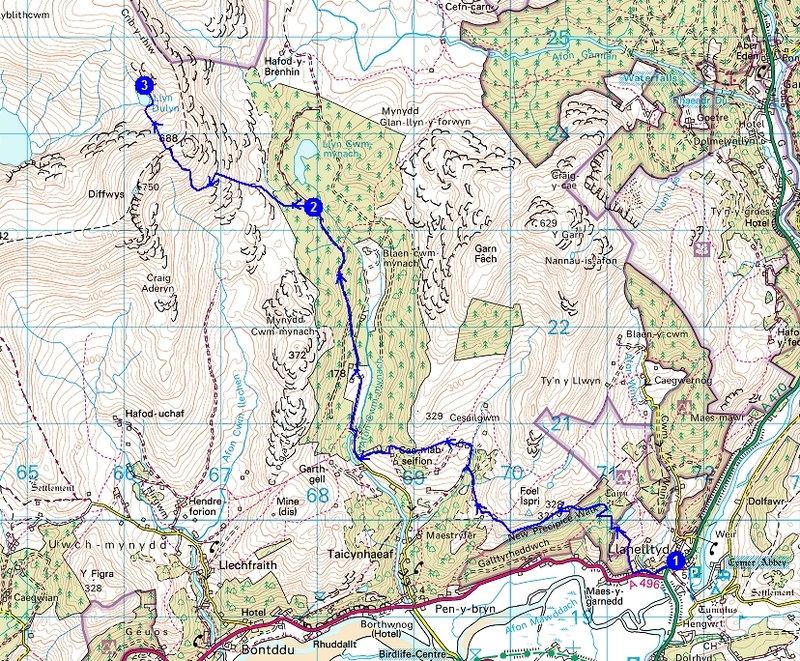 The toughest day however was a round of four much smaller peaks, my leg muscles are still aching from that one. 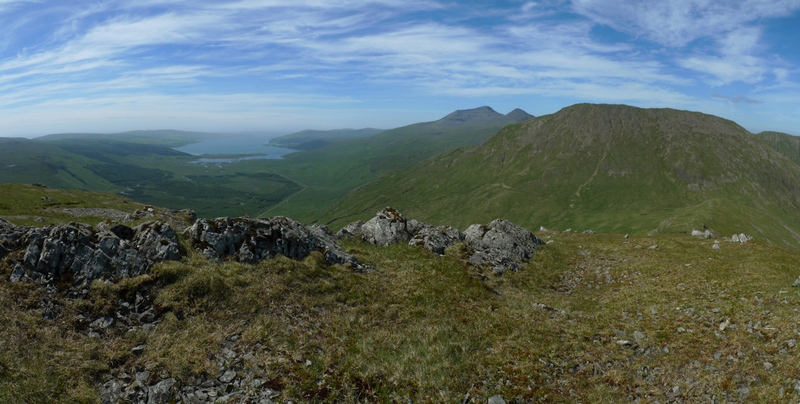 The coastline was also stunning and is one of the main jewels of Mull, hundreds of miles yet to explore there. What struck me was that although the Island is very touristy it does not appear to be on the radar of many hikers (with the exception of Ben More). You can walk all day without seeing another soul, just you the sheep and the tail end of a herd of red deer disappearing over the hill! I will do a write up of each walk in turn but in the meantime here are a few snaps to give a taster of what Mull was like. The following couple of pics were taken on a round of four small mountains that overlook the mountain road through Glen More. 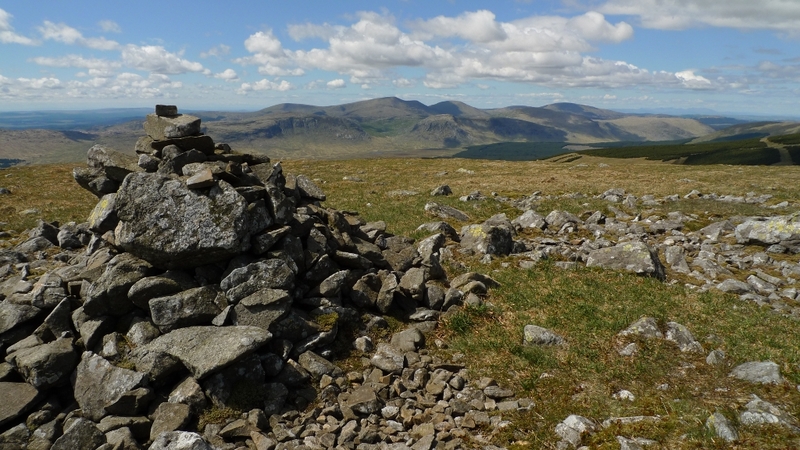 The pointy summits of Ben More and A Chioch dominate the scenery on most of the Island (when not covered in mist). 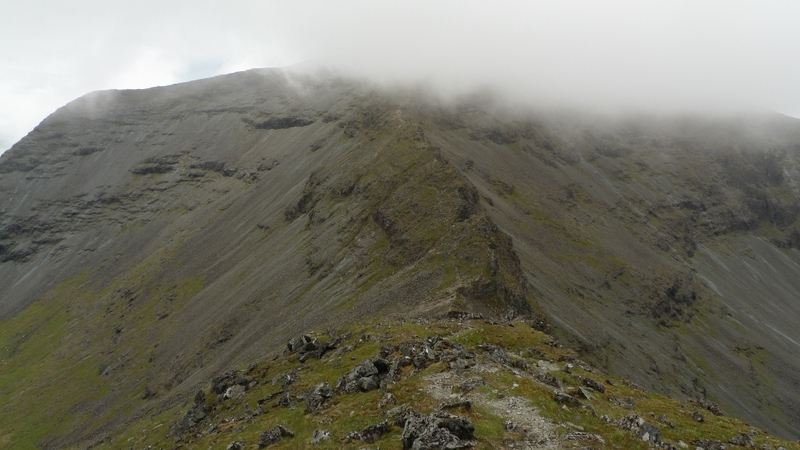 Approaching the summit ridge of Ben More from A Chioch when the cloud suddenly descended out of nowhere. The top is very steep but was hidden in cloud limiting the amount of exposure! Another perfect Bongo ‘wild’ camp at the top of the pass leading to Calgary bay. A fiery sunset taken from the campsite at Craignure, it really was that colour! 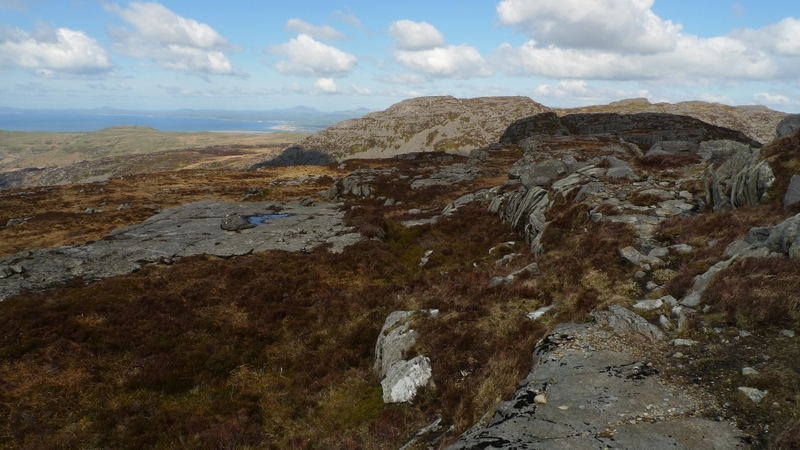 It has often been said that the Rhinogs give the toughest walking outside of the Highlands. After spending three days of the May bank holiday backpacking across them I have to say that I agree! 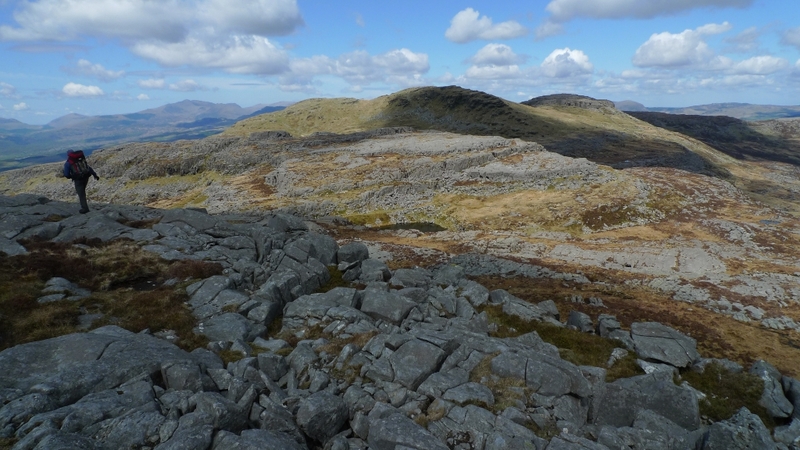 It is many years since I did a traverse of the Rhinogs range. 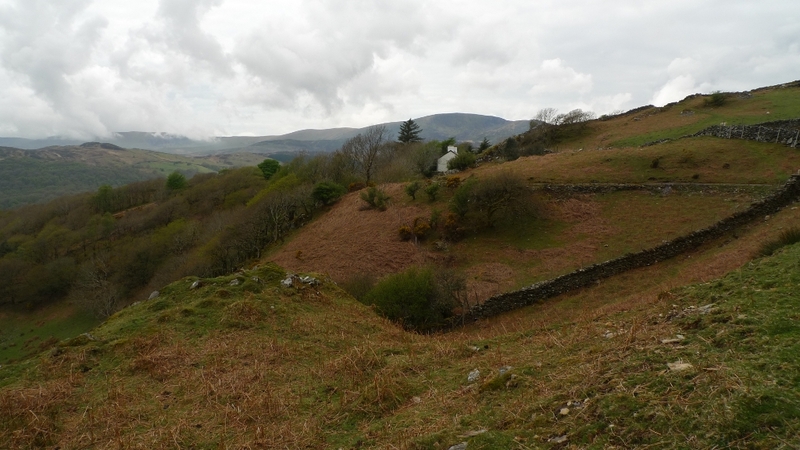 Even then I ‘cheated’ somewhat by omitting the badlands of the middle section from Clip to the Roman steps by dropping into Cwm Bychan. I have been wanting to get back ever since and traverse the whole lot, a mere twenty miles or so. 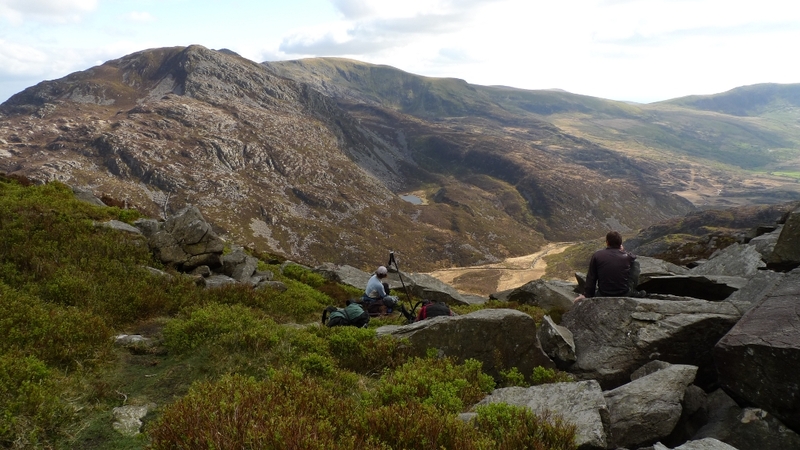 Two days are not quite enough time to get to Snowdonia and back and walk that twenty odd miles. These are not ordinary miles, they are Rhinog miles! 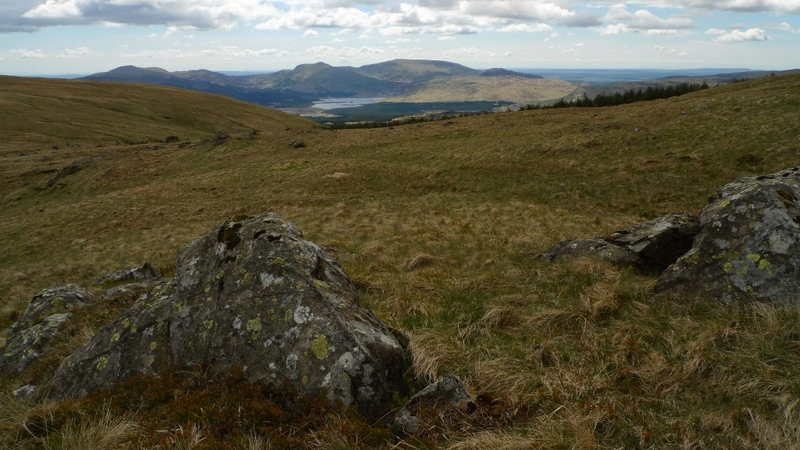 Rhinog miles include waist deep heather, ankle snapping boulders hidden in deep heather, ankle snapping holes hidden in deep heather and then there are those ‘canyons’ to contend with. It would also not be much fun stumbling around in those rugged hills when the mist is down. Thankfully a bank holiday coincided with almost perfect weather, a couple of friends were free and a plan was hatched. To make the most of the Rhinog ‘ridge’ we decided to park up in the village of Trawsfynydd and catch the bus down to Llanelltyd. Because Trawsfynydd is just off of a main road the buses are pretty frequent (although it is a little anoying to arrive just as one is departing). 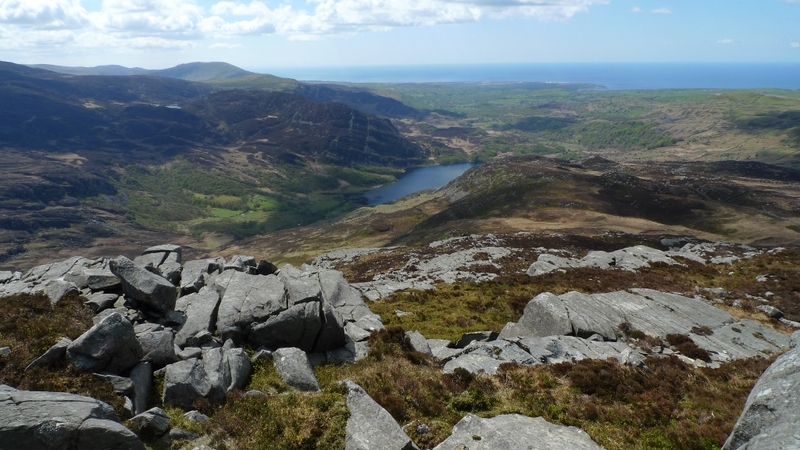 It’s during the bus journey that you realise that Llanelltyd is over 200 metres lower than Trawsfynydd and the days walking will be starting at sea level. We followed the sign indicating the ‘New precipice walk’ and started the ascent in earnest, hot work in the cloudy and humid conditions. The path finally levels out for a bit as it reaches the shore of Llyn Tan-y-graig which was like a dark mirror hidden in the trees. It was here that I managed to pick up my first tick of the year, found crawling across the back of my hand. Nice. After more steep climbing through the trees the path finally emerges and provides stunning views. For the next mile or so is one of the best paths I have ever walked with regards to its effort to view ratio. 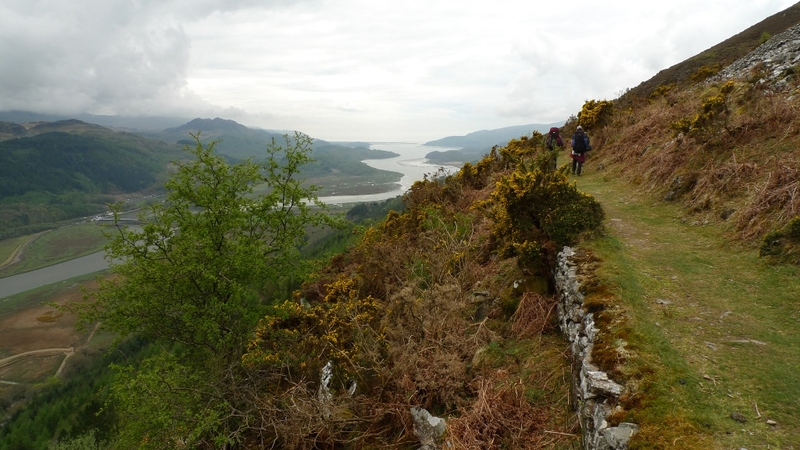 A totally flat grassy path contours the hillside with the Mawddach Estury almost 1000 feet below to the left. A sublime walk and one which I wished could go on forever. As we rounded the shoulder of the hill we could see ahead the southern most part of the Rhinogs with Diffwys drifting in and out of the cloud. The next mile or so down into Cwm-mynach took absolutely ages and the route finding was extremely complex and with a lack of waymarking especially when it was really needed. 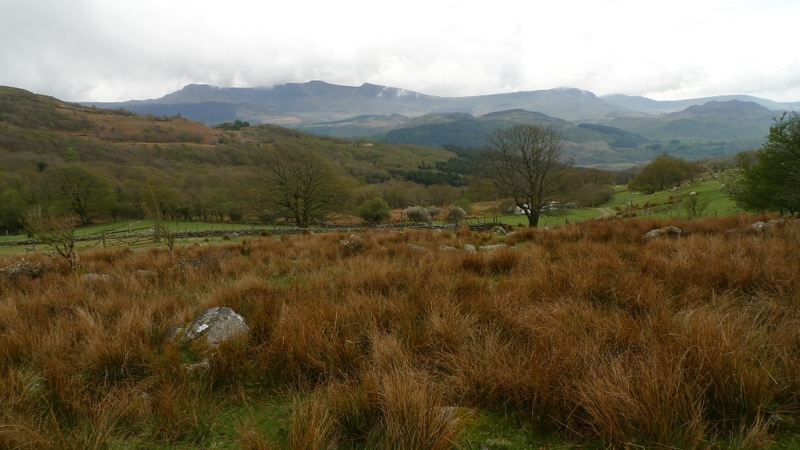 However whenever we turned around there was Cadair Idris giving a good solid mountain background view. 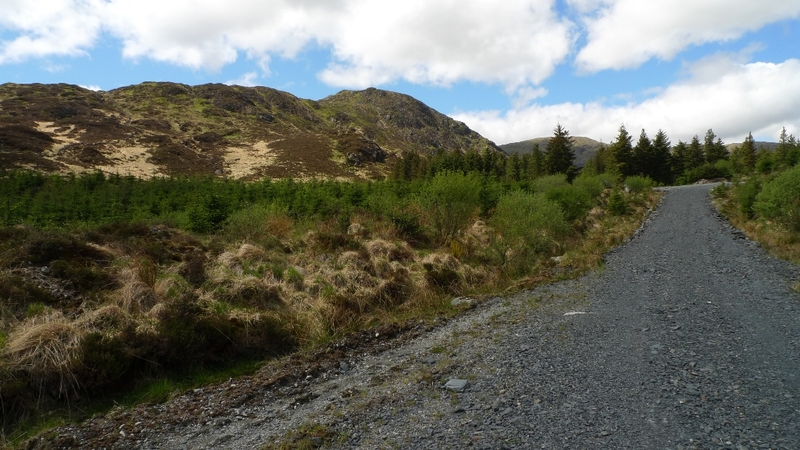 The road along the valley bottom gave way to forestry track as it started it climb. There was a path marked on the map which climbs through the cliffs towards Diffwys, which we initially failed to follow in the right direction. We managed to find where it started but a fallen tree was blocking it true direction, we blindly went off into the woods in completely the wrong direction whilst convincing ourselves we were on a path. 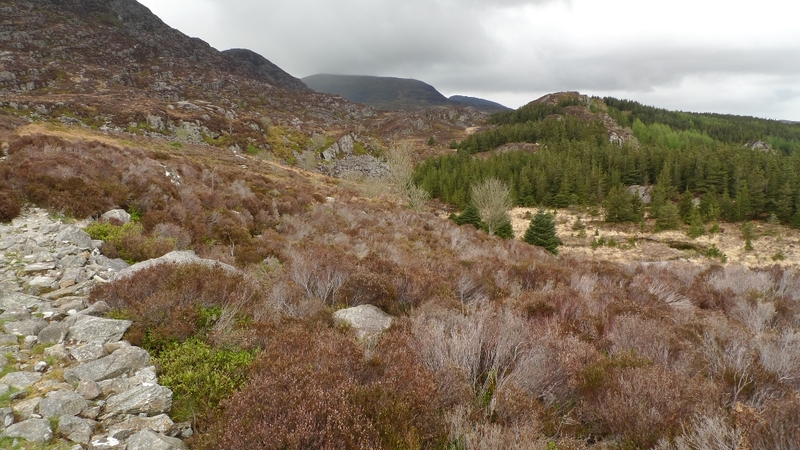 After crashing through the undergrowth we were finally on track along a perfectly engineered path through gradually thinning forest until the wilds of the Rhinogs began to show itself. The way the path was built indicated it must have been constructed for the use of miners and as it wound its way up the hillside only a few feet at a time would be revealed through the deep heather. Behind us the isolated mountain of Y-Garn got smaller as we gained height. 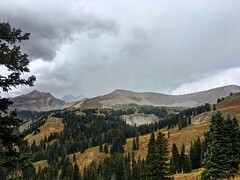 As we were getting towards the top the weather closed in, the cloud dropped and it started to rain. 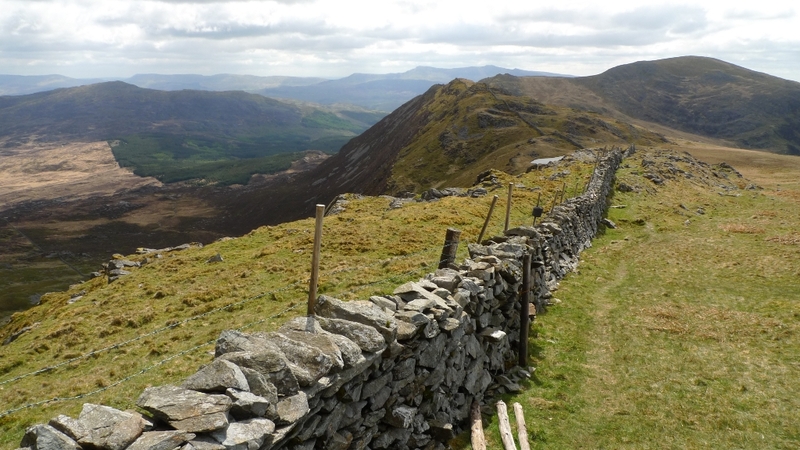 It was a grey swirling world that greeted us when we reached ‘the great wall of Rhinog’. A damp trudge down to Llyn Dulyn to camp for the night. Unfortunately Graham was a bit more eagle eyed than I was and bagged the best looking pitch right next to the lake, mine was a good 50 metres away and a bit more rugged. However he must have lost Karma points as when the wind picked up their tent was punished whilst mine had been pitched in a nice sheltered spot. There was no socialising that evening with dinner being cooked in individual tents whilst the rain drummed on flysheets. It was a slow start in the morning as Graham and Rae had been kept awake most of the night with tent touching nose. At least the wind dried everything off as the morning started to brighten, and I had the opportunity to soak up the views without getting soaked. 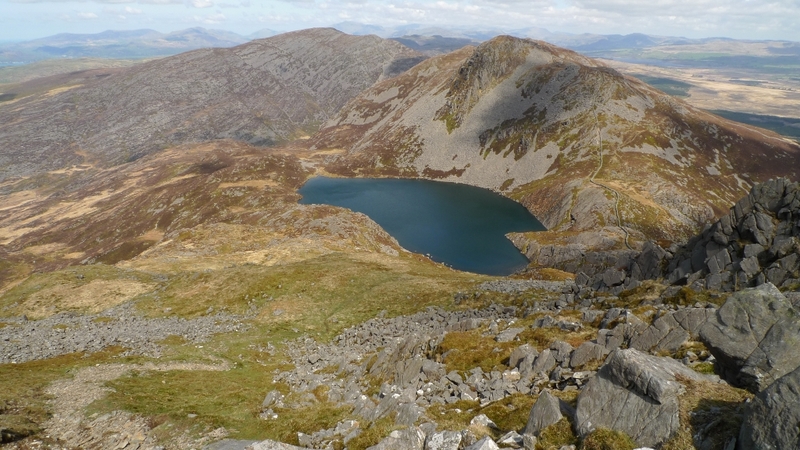 Llyn Dulyn occupies a high bowl in the hills and it great to be able to start the day at nearly 550 metres. 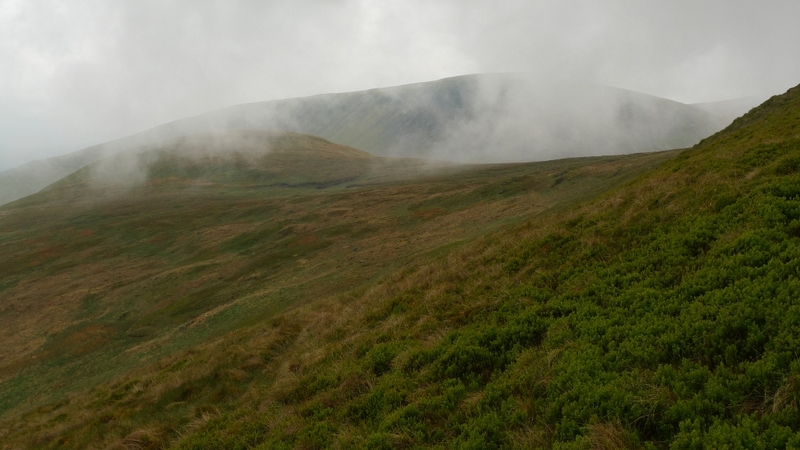 It was nearly 11.00am before packs were on and we were ascending Y Llether with views back towards our campsite. We soon met again with the ‘great wall of Rhinog’ a great piece of engineering which marches across the hills for miles. 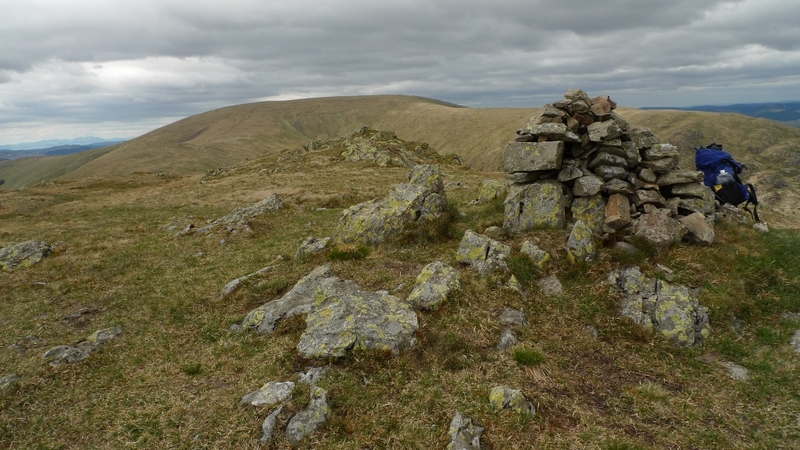 This was followed to the flat short cropped grassy summit which would be a great place to camp on a less windy day. Following the wall north we were suddenly greeted with a view of the ruggedness to come. For some reason the character of the landscape changes immediately from easy grassy slopes to a riot of rock, bog and heather. 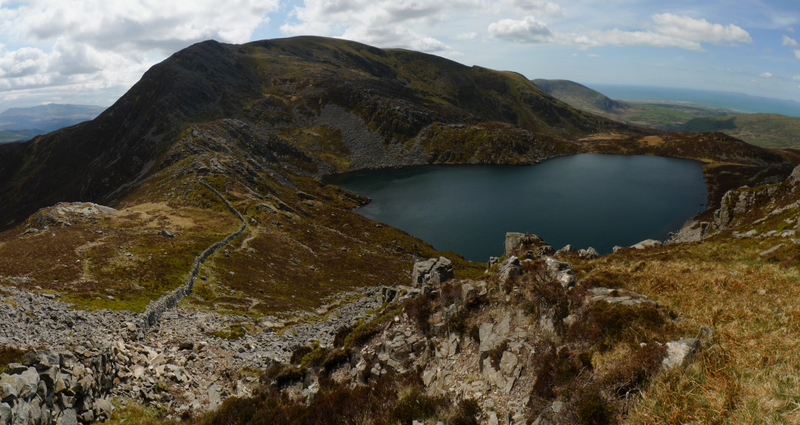 A steep and loose path leads away from the wall and heads down to the jewel that is Llyn Hywel, probably my favourite mountain lake in Snowdonia. The path contours above the lake to the right where giant slabs plunge down into its depths. We sat for a while whilst Graham did a little easy angled bouldering. 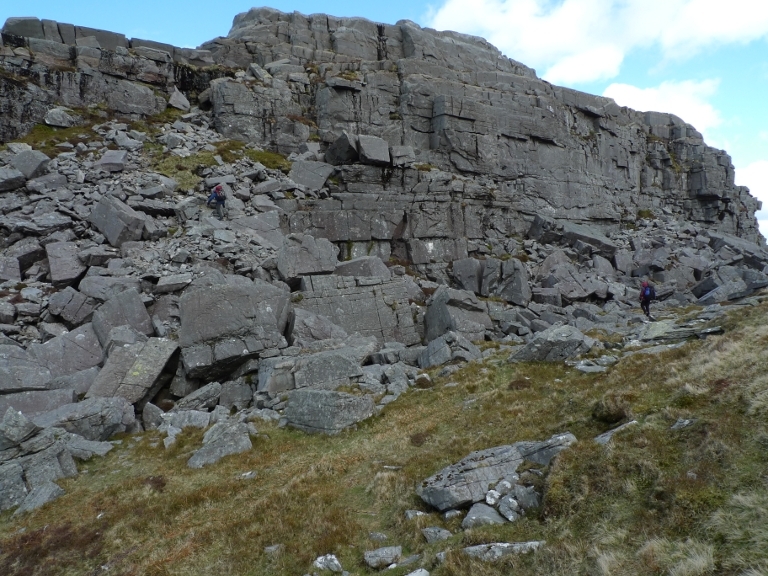 The ascent of Rhinog Fach looks steep and daunting from the lake but it is much easier than it looks with a good path all the way. It is a bit of a pull but the views behind more than make up for it. From the summit the view north is blocked and dominated by the higher Rhinog Fawr. 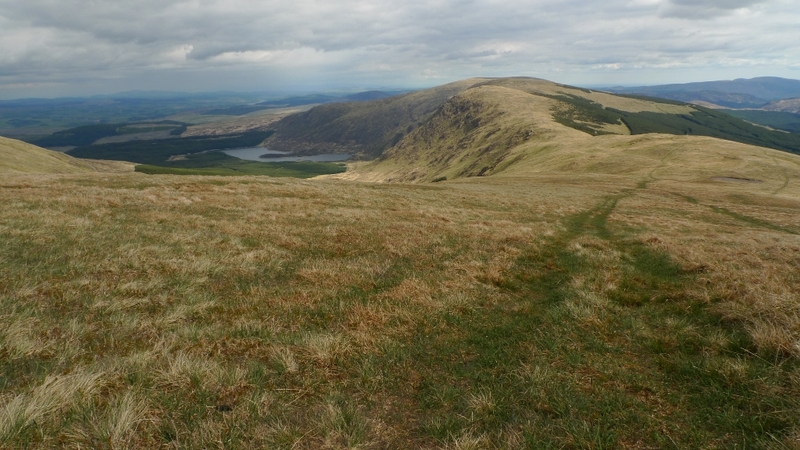 What is not so apparent from here is the huge descent and reasecent in between these two very steep and rugged hills. We found our way off Rhinog Fach by heading north and just before the minor summit descending to the west on a narrow path through the heather. This joins up with a bigger path which we were able to follow to Llyn Cwmhosan without any difficulty. All the while the next big Rhinog was taunting us! During our descent we had been watching a couple struggling along a steep boulder and scree traverse through broken cliffs and heather high up on Rhinog Fach. They took an absolute age to descend down to the lake where we sat having lunch and throughout their descent we often commented that we were glad we were not in their shoes. It really did not look fun. The weird thing is that when they passed us the guy puffed up his chest and started boasting of the amazing route down they had taken. 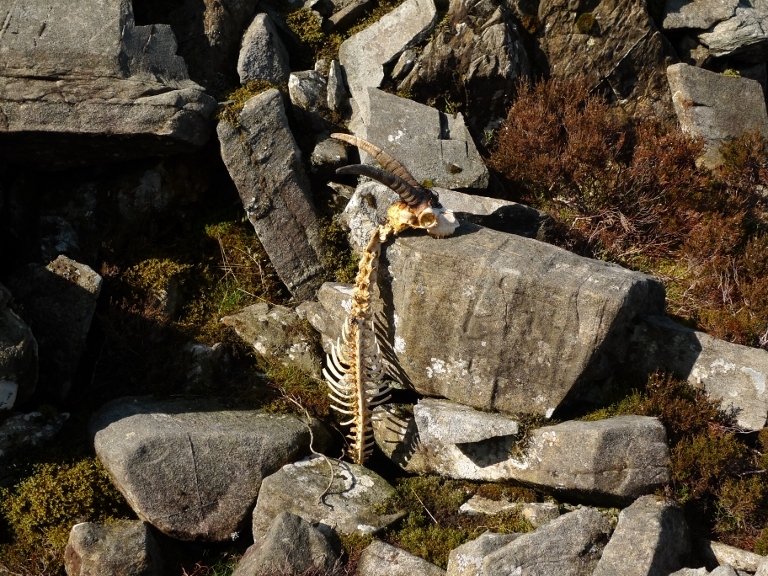 He then began asking us if we had seen their descent. The conversation was a bit of a non starter as we did not act suitably impressed, so he strode purposefully off. Throughout lunch we kept eyeing up the opposition trying to work out the best way up. We could just about make out a very steep looking path almost opposite us, so decided to give it a go. 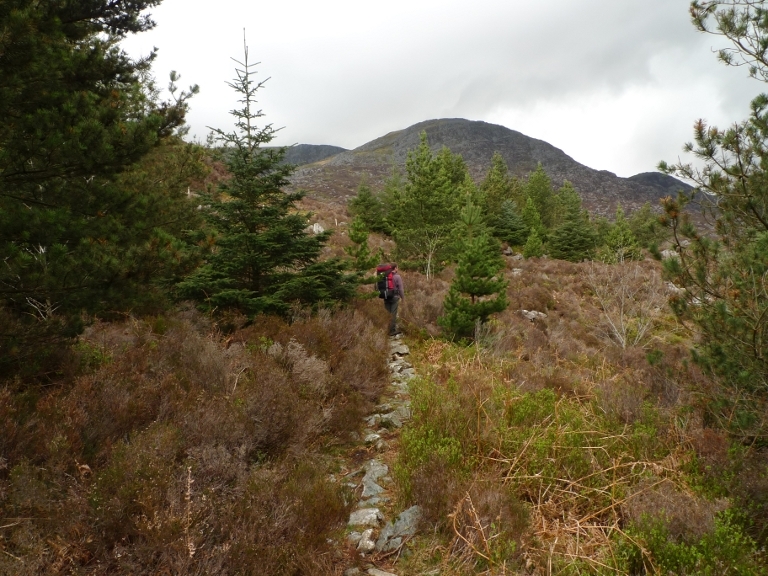 It turned out to be a good decision and although it was very steep it gave some entertaining easy scrambling and it was one of those paths which only reveal themselves a few metres at a time. The views down were stupendous. The path off of this hill was much more defined than the previous descent and we were often in awe of the geology that surrounded us. One cliff was full of faces that resembled the figures on Easter Island and the cliff face had a strangle wave like appearance. Somehow between Llyn Du and the Roman steps we lost the path and found ourselves crag bound with the security of the Roman Steps straight down below us. Some hairy traversing along and between cliffs brought us to the summit of the Roman steps where we had a decision to make. It was getting late, we were tired and we had run out of water. 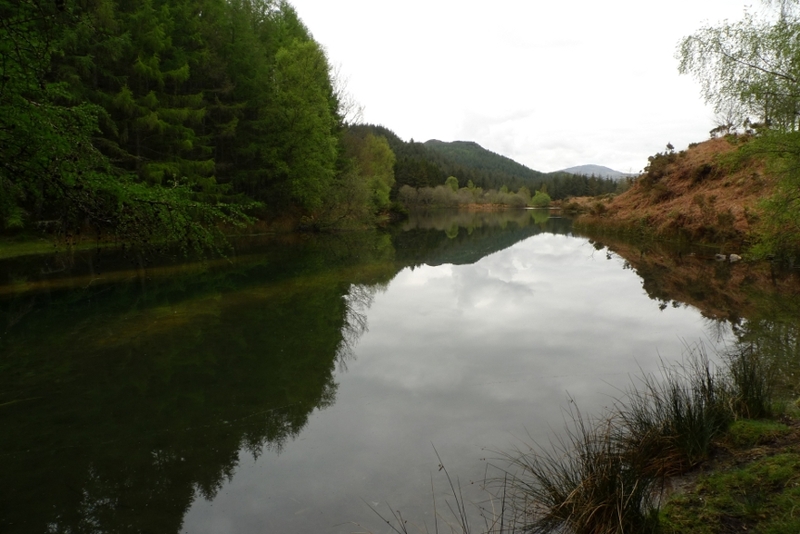 It was decided that we would make towards the head of a stream a kilometre to the north. Although tired and getting very thirsty, the terrain over that kilometre was some of the most spectacular and rugged I have walked across. However my top Rhinog tip is to stick to the highest ground where there is a feint path which leads you along without much difficulty. The map does not make it very obvious but the whole area is dissected by deep canyons which you have to descend in and out of. However don’t lose that narrow path and all will be ok if you come this way! The final canyon was the head of the river valley we planned to camp in. We followed it down to where water was marked on the map, we could hear it under the rocks but there was no way to get to it. We continued to descend with me in the lead when suddenly I disappeared down a combination of a steep slope and a hidden hole. A six foot drop / slide and my leg was racked with agony, I yelled thinking that something was broken. Thankfully it was not but I struggled to put any weight on it and I could not stand with my pack on. Graham and Rae scouted on ahead for somewhere to pitch and water which was found about 50 metres ahead. 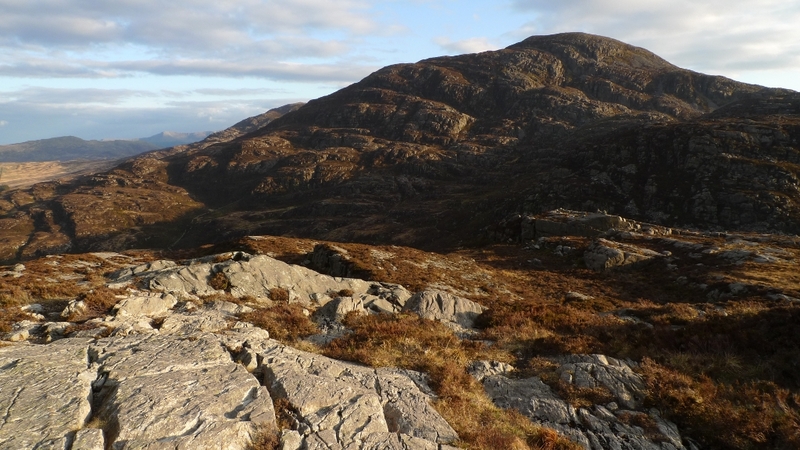 It really was a rubbish place to camp with hummocks and deep heather. However I could barely walk and it was getting dark. It had taken us nearly 10 hours to walk just over 6 miles. Snuggled in my sleeping bag my leg was hurting and I was afraid to move it or it would start to cramp. Soon after dark it started to rain, fat heavy drops beating down on my Akto. The sound started to change making a wet sliding noise, I stuck my head out of my tent and it was snowing heavily and settling all around me. It was May! It dawned bright and sunny and the snow soon melted, however it took a while for the sun to actually reach us as we were surrounded on all sides by steep slopes. Somehow my pitch had been a lot more comfy that it at first looked, heather makes a nice soft bed once it has been flattened. Once again we had to pitch a good 50 metres apart. On the way back up the canyon we passed the only sign of the wild goats that live in these hills. Once picked up again we made sure that we did not lose the narrow path as it went up, down and around small summits and bogs to Craig Wion. 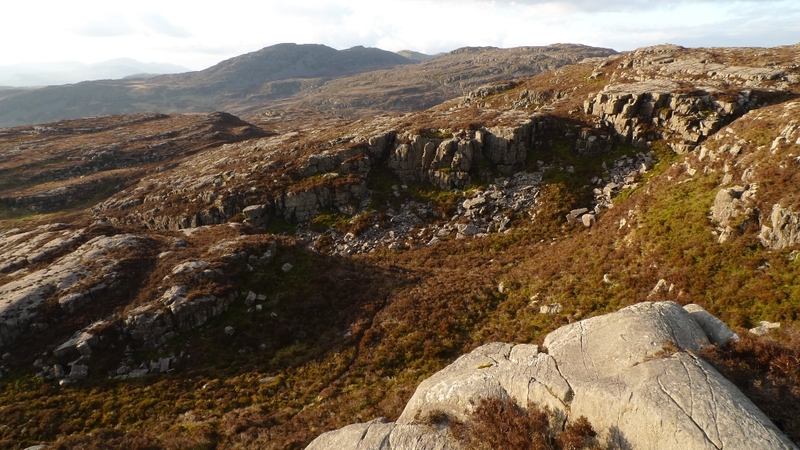 A detour to the rocky top of Clip gave us the best view of the whole weekend, down to Cwm Bychan and the sea beyond. We could see the route we had taken across the wild canyon lands and beyond. 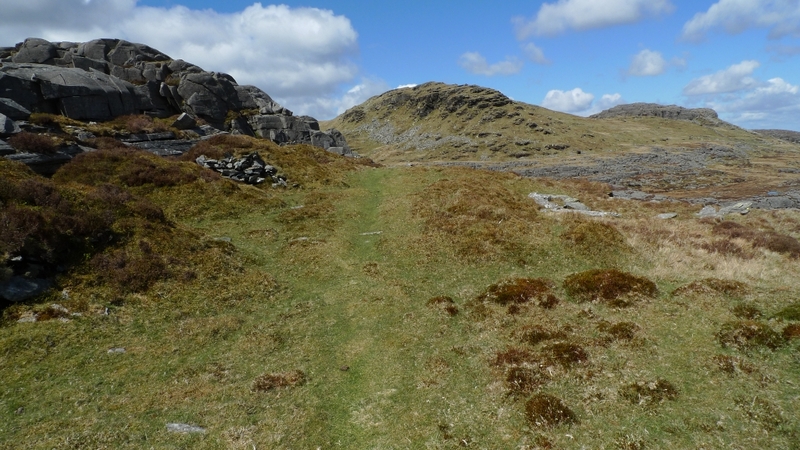 The path continues to head reassuringly on northwards to the last peaks of the Rhinogs which rise above the 2000ft contour. The further north you go the grassier and easier the terrain becomes. 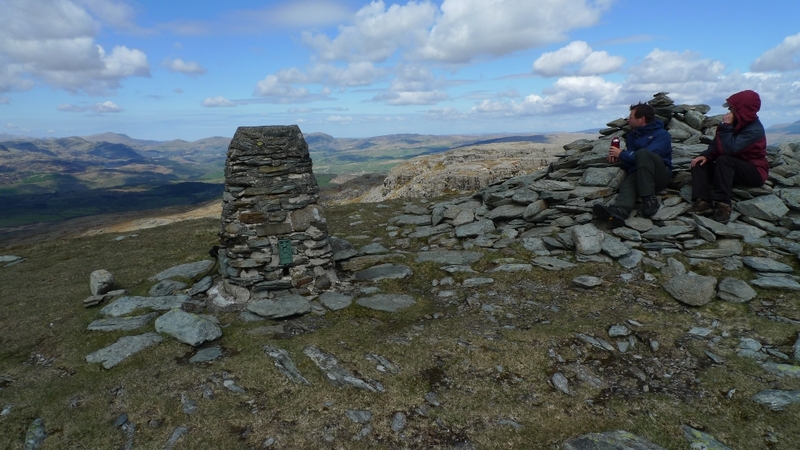 The trig point on the summit of Moel Ysgyfarnogod gives fine views north to the main Snowdonia peaks. We sat for a while trying to name as many as possible, Snowdon itself being a good reference point. 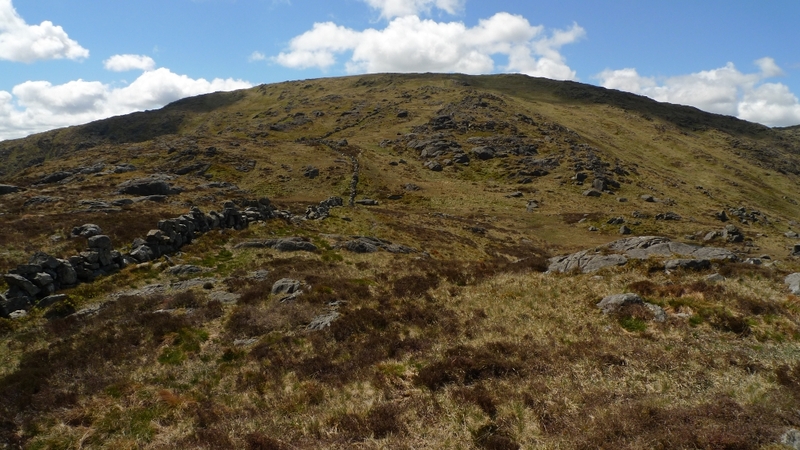 The cliffs leading up to the summit of Foel Penolau are much bigger than the map indicates. In the picture below you can make out Rae on the bottom right and Graham ascending. 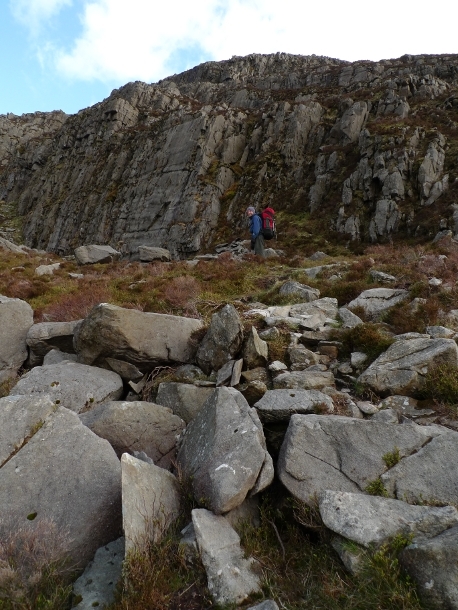 They give some nice easy scrambling. The original plan had been to continue along the ridge to Moel Gyrafolen but time was ticking away and we had a long drive home. 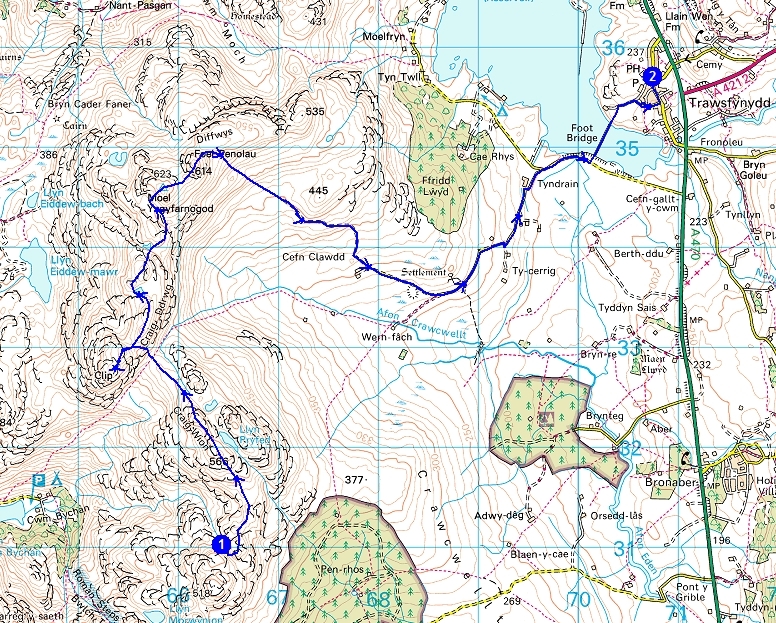 We descended to the south and picked up a track which led to a minor road down to the dam of Llyn Trawsfynydd. The vast size of the reservoir coupled with a strong wind made it feel like you were next to the sea, there were even oystercatchers along its shore. 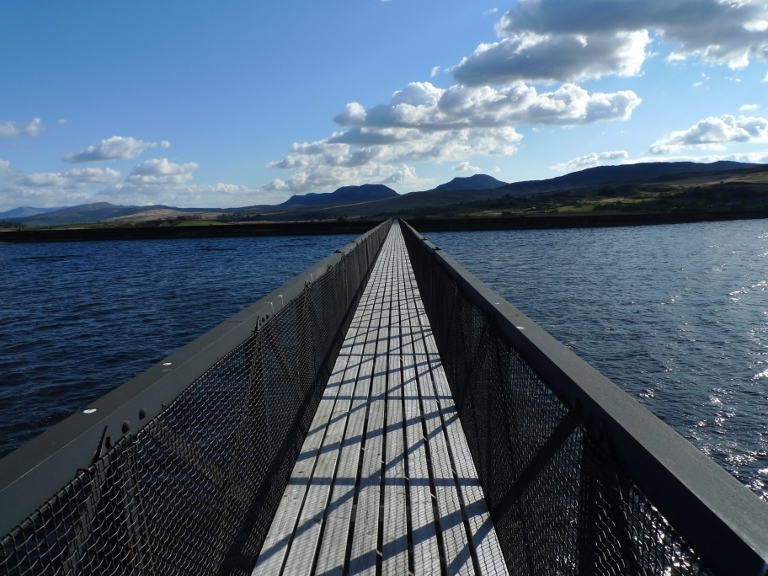 We then crossed the extraordinary bridge across an arm of the reservoir and took a lane back into civilisation. As we turned and looked back one last time at the rugged Rhinogs a farmer mending his dry stone wall told us a story about the hills we had crossed. It involved breasts. ULA Catalyst rucksack – I have had it for nearly a year now, is it the perfect backpacking sack? Haglofs Lynx Pants – are they as slinky and stretchy as they look? Rab Demand pull on – is this ultralight waterproof as breathable as they say it is? 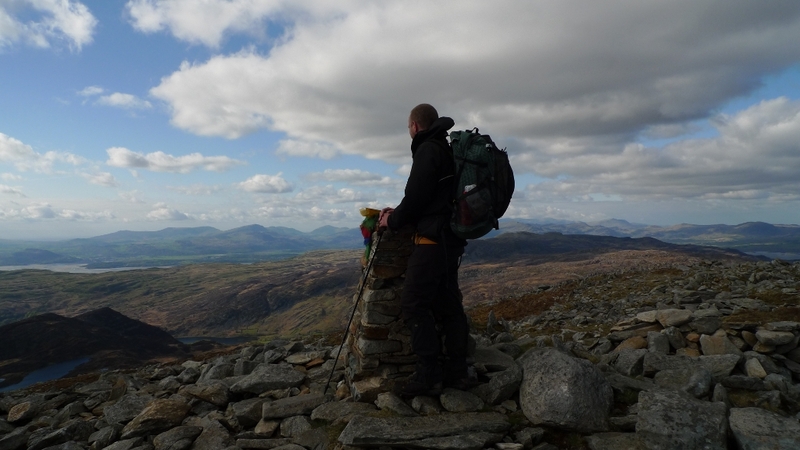 Paramo Velez trousers – are they as badly made as people have suggested? Salamon Fastpackers – are they giving me comfortable tootsies? Rab Cirrus pull on – can a 76g windproof be any good? PHD Hispar 500 sleeping bag – a full winter later, how warm and comfy was it? There are other bits and bobs that will get a mention plus don’t miss a review of the lightest carrying devise ever invented. Oh and before I forget I may even do a write up especially for Robin of the porta potti, he says he is looking forward to seeing one. Maybe to use in the porch of his Scarp?